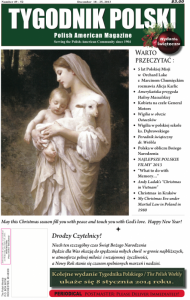 In Polish culture, Christmas is one of the most important holidays of the year. Par traditions, Polish tables around the world are adorned with delicious meatless delicacies every December 24. Wigilia, the Polish term for a twelve-course Christmas Eve supper to celebrate the approaching birth of Christ, is a beautiful and meaningful tradition that is celebrated by many Polish families. Every year, I greatly anticipate the evening on which I will be able to share New Year blessings of happiness and health with my family by exchanging opłatek, a beautifully detailed Christmas wafer. In my household, we love to wait until the first star appears in the dark night sky before beginning our vigil. The star represents the Star of Bethlehem, which, according to Catholic belief, revealed the birth of baby Jesus to the three magi. As a child, I always rushed outside into the cold every few minutes, impatiently searching for the little silver flicker of a star to catch my eye. Once found, supper would begin, opłatek would be shared, and I would automatically reach for my favorite dishes set out in gorgeous china. These included uszka/mushroom dumplings dipped in warm barszcz/beet soup, dried fruit compote, and of course, glorious pierogi. Makowiec, or sweet poppy seed cake, was my dessert of choice. However, dessert was always swift because what followed supper was far better than sitting at the table and hearing grown-ups talk. St. Nicholas, or Santa Clause, is always the treasured guest of the night, even though his presence is never seen and his footsteps are never heard. However, somehow he manages to sneak gifts under the Christmas tree for all the children, and more specifically, exactly when dad happens to leave the table for a few minutes. Dad mentions that on his way back, he happened to catch a glimpse of some presents under the tree. Did he happen to see Santa?! “No,” he always says. Right then, the grown-ups follow the thrilled children to the tree, which illuminates the stunning wrapping papers and bows. As presents are opened and shared, Christmas Eve winds down and everyone begins to get ready for pasterka, or Midnight Mass. Traditional Christmas carols of joy are sung and baby Jesus finally makes his appearance in the nativity scene. Even through sleepy eyes, I cherish this time when I can attend an exquisite Mass. As a part of the Polish Club at the University of Michigan, I have the pleasure of being a part of the annual Wigilia that is hosted on campus the first week of December. Everyone is invited and nearly all traditions are adhered to. Some traditions are even new to me because of the regional variances! I love learning about all of the differences that make Poland such a unique and fascinating country. Polish Club loves to spread the wonderfully distinctive traditions of a Christmas celebration in Poland alongside the company of close friends and great food made by members themselves. What better way to spread the joy and cheer? Wishing you just as much merriment this Christmas season and New Year!